Rite Publishing has recently unveiled a new Patronage Project, The Ruins Perilous for the Pathfinder RPG. I received the first two rooms for review and here are my thoughts. The model they are using is what they define as a Ransom Model, where participants pledge a contribution, and once a goal is met they release the next room in the series. If you pledge a certain amount ($3.00) you get some extra materials, like the maps of the room, a monster token, etc. I must admit that the model itself is not completely clear to me, maybe I don’t know enough of these types of projects, but let me say that after reading the first two rooms I think this is a great project to support. Each installment of The Ruins Perilous gives you a room in a dungeon level, each level apparently will have 18 rooms, and the rooms will all form a mega-dungeon. The two rooms I examined for this review are the Ruined Guardhouse, the entrance to the ruins themselves and the Ruined Gate beyond. The write ups for both are excellent, with “boxed text” (not really boxed here but in italics) to be read or paraphrased to the players. The descriptions are crisp, very useful and imaginative reminiscent of old school dungeons but with a modern touch. The text refers to other rooms that will be part of future releases, and I like this because it shows there is a plan behind this, but if you want to just use bits and pieces to populate your own games it is perfectly possible to do this and simply make your own connections. The accompanying art and maps is top notch, great cartography and the pieces of the map (which come both in black and white versions) print nicely and fit together perfectly. 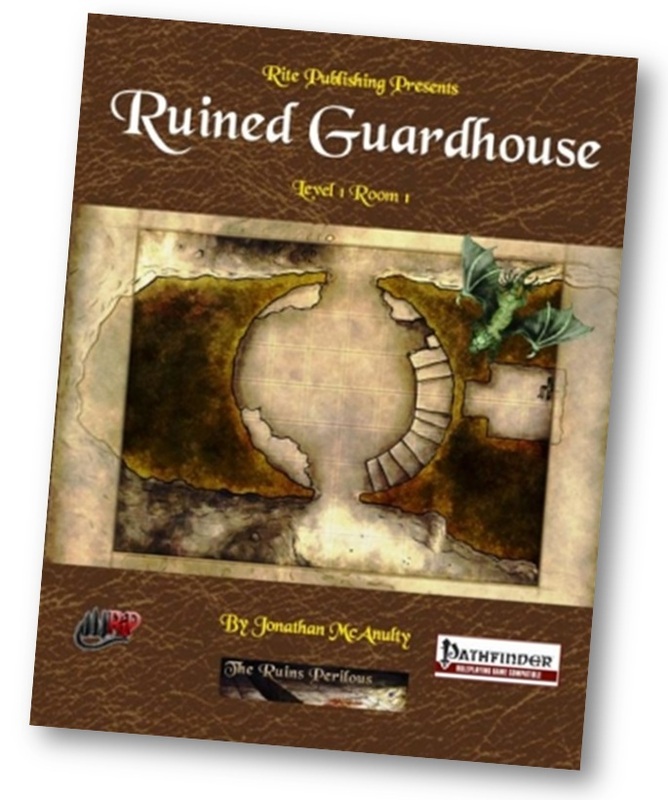 There is a back story about the ruins being the testing grounds for an adventuring guild, the Questor Society and ties to the Questhaven Campaign Setting, another Rite Publishing Patronage Product. Each of the installments I read have encounters appropriate for 1st level characters and each has a new creature with a complete write up and a paper token to print. The new creatures are my only worry; will they have a new creature for each room? It can be daunting and a little implausible, well as implausible as monsters in a fantasy game can be. New monsters are a big draw, and I love them as much as the next GM, but I’d like to see some rooms with traps, or some other role-playing encounter, not necessarily combat. Mind you this is a minor quibble, the Ruin Perilous seems like a great addition to my gaming collection. I really don’t know if they are hitting their goal, but I wish them the best. This is a cool idea and an excellent tool for dungeon lovers! If it sounds interesting make sure you check it out. Ransom is $100.00 (the cost of making each room), once we have earned $100.00 we release the room for free (without bonus material). It is also at this point that we also start work on the next book, once we have finished that book we open it up for ransom. Thank you for clearing that up!! !